Last night in printmaking class at Red Brick, we learned to make Chine-colle prints. 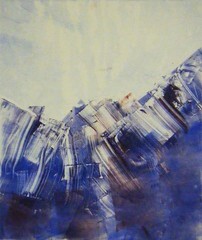 Chine-colle means pasted paper, and the process combines collage and printmaking. We put glue on the pieces of paper to be collaged. arrange them on the plate glue side up, and run the plate through the printing press. The result is a collage. Chine-colle can also be combined with printing with ink. This is the first of four Chine-colle prints that I made last night. The instructor suggested we make a Chine-colle with a drawing or a picture. I didn't have anything at hand, so I made a quick drawing of a mountain and sun with magic marker. I used textured paper for the band at the bottom of the composition. I also inked a second plate with blue because I wanted to try a "double drop" (two plates) to see how the printing and collage worked together. This is what the image looked like when I was finished. The only disappointment was that the textured paper was completely flattened by the press. Otherwise, I was happy with the image, but more important, very excited about learning this new process. This is a side view of the collage and decoupage project I have been working on, a keepsake box covered with pieces of printed metallic ribbon. The heart-shaped box originally held a Mother's Day gift from my daughter. When I worked on this last Wednesday, I didn't have much time, so just intended to add some pieces of brown ribbon to the background of the floral design on the top. But I found a good sized piece of ribbon in a red and gold paisley design that I really like. 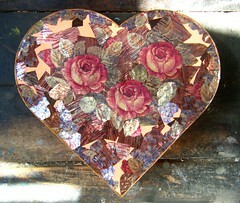 I used it to make my "Ribbon Roses Tray" last year, and I didn't think I had very much left. So I decided to start the edge of the top of my heart-shaped box by pasting pieces of the red and gold paisley pattern all around the edge, turning the box as I worked. I will have to use other patterns to complete this, but now I have some pieces of red paisley throughout the edge of box. Last Wednesday morning, I had to go over to the studio to put away my stuff from printmaking class on Tuesday night. It was a busy week, and I wasn't intending to stay and make art. But once I opened the door to the studio, I decided that the outside world could wait for just a little while. 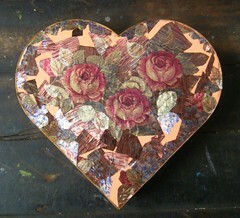 So I worked on this project, a heart-shaped box that once held a Mother's Day gift from my daughter. 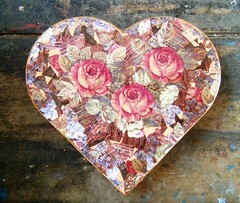 I have been creating a collage and decoupage project out of it with printed metallic ribbons. Because I wasn't planning to stay long, I decided to concentrate on filling in the background with pieces of dark brown ribbon. I also added a bit to the leaves and flowers when the right piece appeared. (Because the right piece of paisley pattern ribbon turned up, I also started working on the side of the box lid. That isn't visible in this photo, but I will post a side view tomorrow.) I stayed for just an hour, but left the studio with more energy to draw from as I returned to the outside world, which was still there, waiting for me. This is the last print of four from printmaking class last Tuesday night. For this one, I re-used a plate in order to keep the same composition, but I added more ink in green and a teal blue. 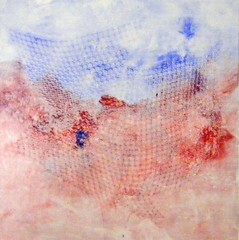 I also ran the brayer over some netting to add texture. Although it was late and I was really tired when I finally finished this print, I was glad I kept going because I thought it was the best of the four prints I made that night. The combination of dark blue sky and pink mountains reminds me of looking toward the mountains west of Boulder as they reflect the rays of the eastern sunrise. 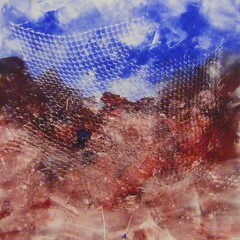 This is the third of four prints that I made Tuesday night in printmaking class at Red Brick Studios. For this image, I began with a plate that already been printed. (It was one of two plates used to make the image posted here on April 23rd.) My original idea was to do a ghost print of the plate by running it through the press again, but there wasn't enough ink left on the plate. So I put additional ink on the lower portion of the plate, and carved out the white areas by removing the ink with a piece of cardboard. I left the top portion of the plate alone, so in this image, the area that looks like sky is actually a ghost print. I like to send e-mails to wish close friends and family a happy Passover, but this year I couldn't seem to get that done, not only because the week was very hectic, but also because I couldn't seem to get an idea for a Passover image. Well, I thought about this off and on all week, but had no good ideas. None. In the meantime, I started every day with matza for breakfast. I like to butter my matza, but it breaks into pieces if I butter it on a plate, so I put in on a paper towel. Now, mind you, I have been eating matza for breakfast everyday this week (not to mention sometimes for lunch and for snacks). Same routine, every time. Well, this morning I knew I had to send greetings out or else because Passover would soon be over, and as I made coffee, I considered punting and sending a photo of spring flowers or maybe going with a nice commercial e-card. I was still thinking as I got my matza out for breakfast and put it on the paper towel to butter it. 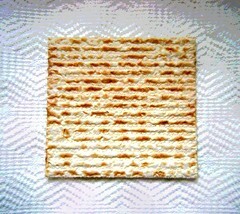 I found myself admiring the pattern of the matza against the pattern of the paper towel. And suddenly the light dawned on Marblehead (as they say in Massachusetts) and I decided to take a photo of the matza for my little Passover e-mails. Once I transferred the photo into my computer, I posterized the image in Painter IX, and added a little more color with transparent "digital pastel". So here is my Passover image, with a tip of the hat to Bounty for the great pattern in the paper towel and Streit's Matzohs for the beautiful patterns in the matza. I can still use this image this year, although we are almost in the "Belated Passover" greetings category, and Hallmark has no card for that. But I also made this photo into a pattern in Painter IX, so I can use the pattern to make new designs when it is time for Passover next year. This is the second of four prints that I made on Tuesday night in the printmaking class at Red Brick. I used two plates to make the first print (posted here yesterday). After that, my next idea was to use those plates again to make ghost prints (by running the plates through the press again), but there wasn't enough ink left on the plates to do that. But I did want to keep the a similar composition. So I added more ink to each of the plates. 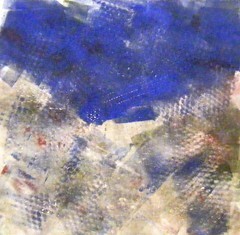 For the print in this post, I added blue and red to the bottom part of the plate, rolling the colors on with a brayer. Then I used cardboard to scrape out the highlighted areas of the mountain peaks. I left the top part of the plate alone, so the sky is really done as a ghost print. This image really reminds me of the Colorado mountains back home! This is the first of four prints I made in last night's printmaking class at Red Brick. 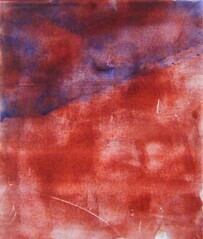 I made using with two plates, one inked with blue and one with red. I tried to create texture with some cut paper, but that technique didn't work because the printing press flattened the paper so much than none of the ink came through. But instead of giving up, I revised my idea in mid-stream, and actually added blue ink to the plate while it was still in the press! This was clearly the most frustrating of the four prints I made last night, and it is probably also the least successful from a visual standpoint. But I learned a lot from doing it, and I am glad I decided to keep going. This began as a photo taken during a recent walk at Long Hill Gardens. 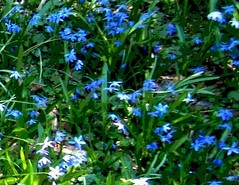 These little blue flowers are blooming everywhere, creating the effect of a blue carpet. The scene they create looks magical, like Munchkinland (where everything is blue) in The Wizard of Oz. Well, I am a sucker for magic, so I took some pictures with my little digital camera. I wanted to capture the effect of a blue carpet with a wide shot, but I also took some closeup shots as well. Once I transferred the images into my computer, it was easy to see that the close-in views work much better. So I cropped and then cropped again to get a good view of the flowers in a pleasing composition. Then I posterized the image in Painter IX. I like the effect of the sunlight playing on the little blue flowers. It is the third week in April, and about time for the magnolia tree to bloom. 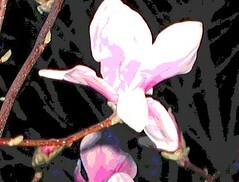 I have seen a few magnolia trees blooming around town, but the one in my yard is budding, not yet blooming. This tree is in a shady location, on the north side of the house, but I think it will bloom tomorrow if it is warm enough. This image began as a photo that I took of the same magnolia tree a few years ago, and I decided to posterize it tonight. Flowers help us mark the seasons, and in Boston, along with baseball and the Boston Marathon, April means magnolia trees. On Friday morning, I went to Red Brick to work on this collage/decoupage project. The heart-shaped box once held a Mother's Day gift from my daughter. 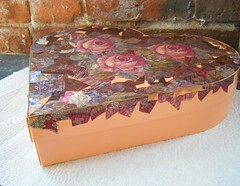 Now I am transforming it into a keepsake box, using metallic ribbons printed with floral and paisley patterns. On Friday, I concentrated on the border, which is going to be blue forget-me-not flowers and leaves. I also added more leaves around the roses. Progress seems slow because I have to find the right piece of the right pattern, and then make it fit. With the flowers and leaves, I try to place the pieces so the result looks somewhat natural or believable (so each leaf looks like it could be attached at that angle, etc.). The experience is much like doing a jig-saw puzzle in reverse. However painstaking the work, it is not tedious to me, and I am having a great time. This is fortunate, because this is just the top of the box, so there is quite a bit left to do. I always buy a big bunch of parsley for Passover. I love the taste of parsley and I always eat any that comes my way! But I also love the way it looks! 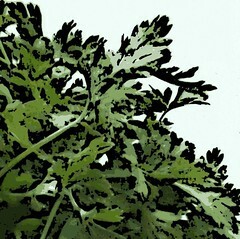 This image began as a photo that I took of a bunch of parsley on my kitchen counter. 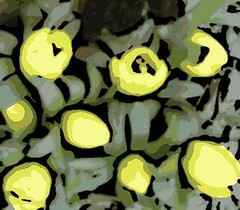 I decided to make the photo into a digital woodcut with Painter IX to emphasize the texture of the leaves. Then I used a gentle color overlay on the background. This may sound like a lot of trouble for something that is usually just a garnish, easily overlooked. But on Passover, parsley becomes part of the rituals of the seder. (It is dipped in salt water, combining the hope of spring and the remembrance of tears). Ritual, like art, can call our attention to things that we ordinarily overlook. This is the third print from Tuesday night's printmaking class at Red Brick. I am using the mountains (Colorado Rockies) as subject matter. For all the prints I made this week, I experimented with using materials to create texture. 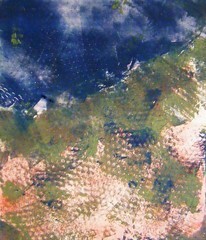 For all three prints that I made, the material I used was some netting, the kind used to package fruits and vegetables. In the first print (posted two days ago), I ran the plate through the printing press with pieces of netting on it. The second print (posted yesterday) is a ghost image of the first, so the grid pattern was made by ink that remained on the plate once the netting was gone. For this third print, I put the pieces of netting under the brayer and then ran the brayer back and forth over the netting to create texture. Then I ran the plate through the press, and this is the result. 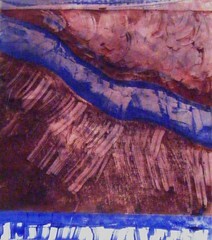 This is the second of three prints that I made in Tuesday night's printmaking class at Red Brick. After I made the first print (Mountains and Sky with Grid, posted here yesterday), I could see that there was still a good amount of ink left on the plate, so I decided to try making a ghost print from the plate. (A ghost print is a print made from the ink remaining on a plate after it has been printed). This is the result: the same imagery with softer colors. I was experimenting with adding texture. I created the grid with pieces of netting, and the pattern remained on the plate after I removed the net. I didn't know if the grid pattern would show up in the ghost print, but I was glad to see that it did. Last night was the first of three more printmaking classes in a session I am taking at Red Brick Studios. 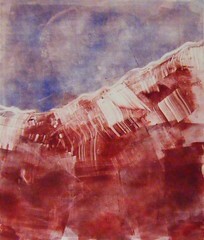 I am using memories of the Colorado mountains for my imagery because I love the mountains, and often paint them. With familiar subject matter, I can focus on process, which certainly gave me enough to struggle with last night. I decided to experiment with adding texture with various materials. Of the materials available, I chose netting (often used for packaging oranges) because I liked the square grid pattern. For this print, I used one plate, and applied red and blue pigment to create mountains and sky, using a small, narrow brayer to create some variation in value. Then I tore triangular pieces of netting, ran the brayer over them to try to get them to stick, and then put the whole thing through the printing press, net and all. After running the plate through the press, I was VERY disappointed because the netting had left very strong white areas that overwhelmed everything else in the image. But instead of taking the print off the press and discarding it, I removed the netting from the plate and ran the press over the plate (and the same piece of paper) a second time, in the other direction, and the result was the image posted here here. The added color from the second time through really helped. The netting was still visible, but more subtle, and the mountains and sky could also be seen clearly. I was much happier with the result. The grid inexplicably floating in the sky is surreal and illogical, but makes me think about visual puns (sky and water), and verbal puns, like cell phone networks or internet crisscrossing the mountains. In any case, I am glad I kept going and found a way to salvage this image. 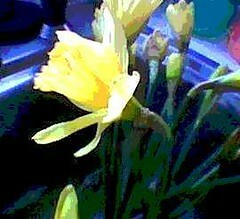 Yesterday I posted a posterized version of a photo of daffodils, taken back in 2006. Yesterday I also made a digital woodcut of the same image. I used Painter IX and played around with the options until I had the amount of black and the number of colors that I wanted. I think this version is a bit more dramatic than the posterized photo. Today was a busy day, but while I was right in the middle of a very important conversation, I realized that I was looking at daffodils blooming outside. That's when I realized that after all this waiting around for it, spring snuck up on me while I wasn't looking! Unfortunately, there was no chance to take pictures of the daffodils I saw today. I hope I will another opportunity, but meanwhile tonight I found some photos of daffodils that I took back in March of 2006. 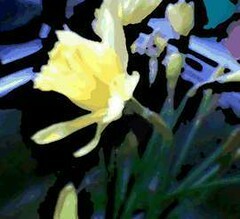 The one I like best is very simple picture of daffodils in my stainless steel kitchen sink, as I got them ready to go into a vase. Tonight I opened the photo in Painter IX and used digital pastel to clean up one little distracting piece of foliage. Then I posterized the photo, and here it is. This weekend I spent a little time working on this project. This is a heart-shaped box which originally held a Mother's Day gift from my daughter. Now I am transforming it into a keepsake box with collage and decoupage. I am using printed metallic ribbons with acrylic medium and a little bit of metallic acrylic paint for the edges. This weekend I worked mainly on the border, using going to little blue forget-me-not flowers and golden leaves cut out of the ribbons. I still have a lot of ribbons, but there are only two remaining that have a floral design. So it takes a little time to find the pieces I need. I am not doing a lot of planning, but just let the design develop as I work, and I sometimes I feel like I am watching this thing assemble itself. Well, I only worked on this for a short while, but it was wonderful time spent in this fantasy garden. This is the photo that I posted yesterday, but posterized with Painter IX. I adjusted the levels of posterizing until I got the variation in shape and color that I was after. I am glad that I stopped rushing through my errands just around long enough to take this picture at the grocery store. Here north of Boston, it's a long wait for spring weather, although we are finally getting some warmer days here and there. Today there were baskets of pansies on display outside the supermarket, a sure sign of confidence that spring is coming. 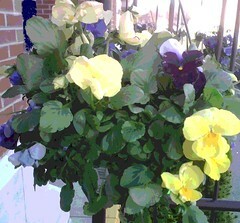 Pansies can be planted when the temperatures are still too low for anything else. 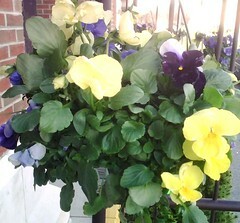 I was happy to see the pansies and took some quick pictures with my phonecam. I liked this photo the best, so I cropped out a truck that was in the background, and adjusted the contrast. Then I opened the image in Painter IX and used digital pastel to repair some torn petals on one flower. I also used digital pastel so simplify a distracting pattern in a small area of the background. This was a bit of fuss for this little image, but I thought this photo had potential and I wanted to clean it up to posterize it. To be continued. . . . This is a posterized version of the photo I posted here yesterday. I opened the image in Painter IX and adjusted the posterizing controls until I got the effect I wanted, the bright lights dancing on the water. This is a crop from a photo that I took one night last week with my digital camera when we stopped at Beverly's newest Starbucks. The dog and I waited in the car while my daughter ran in to get coffee. The parking lot has a great view! I loved the lights of the city on the water so I grabbed my digital camera and took a quick picture without thinking about settings or even the fact that my headlights were on! And then it was time to go. Later, when I transferred the picture into the computer, I could see that the headlights had indeed ruined the foreground, and I needed to crop out the car's interior. But still, once I had done the cropping, I did have a nice image of what interested me most, the city lights reflected in the quiet river. 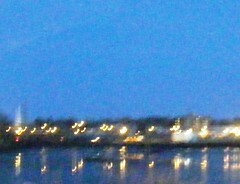 Because of the darkness and the aggressive cropping, the focus is very soft. (It's not the camera this time; it's the photographer!) But I kind of like the effect of the soft focus. And I think it has possibilities for a posterized image. To be continued. . .
Today I finally had a chance to go back to the studio and work on this project. 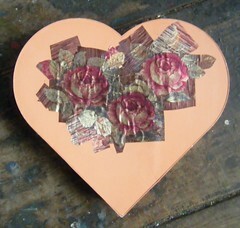 I am making a collage and decoupage project from this box that originally held a Mother's Day gift from my daughter. I am creating the design using printed ribbons, two or three inches wide. Today I added some forget-me-knot flowers around the edges of the heart. (After all, this is going to be a box for keepsakes.) I also used some gold metallic paint (acrylic) around the rim of the box. This will make it a bit easier when I am pasting ribbon near the edges. The paint is transparent in thin coats, and works well with the ribbons I am using, all of which have a metallic sheen. I had a great time this morning. The hour flew by and it was hard to stop! To be continued. . . . This is the second print that I made last Thursday night at printmaking class at Red Brick. It was made by printing a plate a second time without re-inking it, creating a paler version of the same image. I had already made a monotype using two plates (see yesterday's post). I removed the shapes cut from myelar (inked in red); there was still plenty of blue pigment left on the plate, especially where those myelar shapes had been. So I used the plate to print on another piece of paper, and here it is. I was surprised by some of the effects, but pleased on the whole. 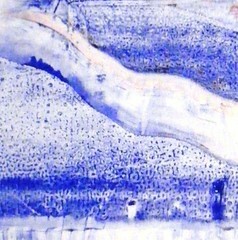 The texture was created when I pulled off up the myelar sheets, and there are also some traces of red pigment. The image reminds me of the Colorado mountains on a snowy day. 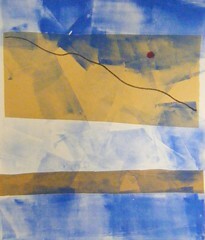 I made this monotype in Thursday night's printmaking class. We each made a print using two plates. The teacher also demonstrated how to use shapes cut from myelar sheets. I am still using familiar mountain imagery so I can concentrate on learning the process. First I made the cutouts, cutting the myelar sheet into two pieces with just one curving diagonal line, for a mountainous shape. I decided that I would use the other half of the myelar sheet at the top of the plate, so the bottom edge would create another mountain silhouette. Then I covered the first plate with blue pigment, put red pigment on the two myelar shapes, and placed them on the inked plate. I used cardboard to scrape away some of the red and blue pigment, to add texture and to create light areas where ink from the second plate could show through. For the second plate, I mixed a pink color and added some gel to create transparency. The second plate is supposed to add a layer of transparent color and perhaps texture to the print. When both of my plates were ready, I ran the first plate through the press, creating the dark red and blue areas. Then I ran the same piece of paper through the press with the second plate, creating the pink areas. The two plates weren't lined up perfectly, so there is some white at the bottom and a pink area at the top. But I liked the effect and really enjoyed learning something new! This is a colorized version of the photo I posted yesterday, a snapshot rescued from my mother's album. This was taken during my parents' honeymoon trip to New York, just before my dad was shipped overseas to Europe. The pink tone in the photo appeared when I scanned it into the computer, and it gave me the idea of adding more color. I used Painter's digital pastel to add some soft color, to make it look like an old tinted photograph. 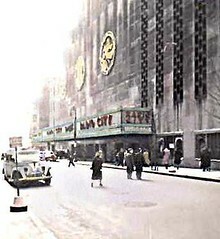 (I looked at some color images of Radio City because I wasn't sure of the colors. During the day, the big letters of Radio City look red, but at night when the lights are on, they look orange or yellow.) Well, in any case, I am not going for historical accuracy here. I am just using color to suggest the sense of excitement of seeing that I imagine my mom experienced when she saw Radio City Music Hall on her first trip to New York City. Today I found a snapshot in my mother's photo album and decided to rescue it. This album begins with my mom's first date with my dad. They met during World War II; my father was from Brooklyn but was stationed in Pueblo, and met my mom there at a USO dance. After dating just three months, they married on April 4th, and went to New York for a brief honeymoon (and for my mom to meet dad's family) just before my dad was shipped overseas. My mom kept the album going while he was away, including snapshots of what was going on at home in Pueblo, and snapshots that my dad sent home from Europe. She pasted the photos down on black paper and wrote captions for the photos in white ink. That's how I know that they went to Radio City Music Hall on April 22 to see the Easter Revue and "Flight to Freedom". This was one of several Broadway shows and performances that they saw that week, and I am sure the excitement of the trip and the shows was a great distraction for both of them, in the face of an uncertain future and the long separation ahead. I don't whether the photographer was my mom or my dad. The original snapshot is very small. I scanned it into the computer. I really liked the basic composition, so I just cropped it a bit to eliminate some sidewalk and a manhole cover. I adjusted the contrast, and used Painter IX to sharpen the focus and clean up one scratch. The pink tones were there when I opened the file in the computer. I kind of like the pink; in fact, it made me think about adding more color to the image. To be continued. . . .
On Tuesday, I went up to the studio and started a project I have been thinking about for quite a while. I am going to do another collage and decoupage project, similar to the tray I made last summer (which you can find here by searching for "Ribbon Roses" or styrofoam). Just like last time, I am using printed metallic ribbon, given to me by a friend. 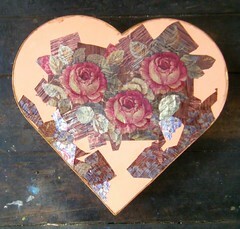 But this time, I am covering a heart-shaped box which originally held a wonderful Mother's Day gift from my daughter. I saved the box because I wanted to make it into a keepsake box. On Tuesday, I started by covering up the big Clinique label on the front, and worked out this composition as I did so, starting with a few of the cabbage roses leftover from the Ribbon Roses Tray. I am using acrylic gel medium as the glue. I had fun placing the roses and leaves, and had a wonderful time getting this started. I know from making the Ribbon Roses Tray how laborious this can be, but I hope to avoid some of the mistakes I made last time. In any case, I really enjoyed working on this project, and can hardly wait to get back to it. 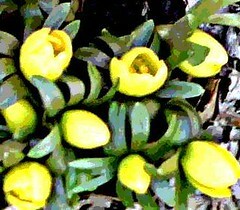 Two days ago, I posted a photo of yellow crocus, and yesterday posted a posterized version of it. This is a digital woodcut made from the same photo, using Painter IX. The colors are less intense, but the shapes and patterns are more apparent. I think this version has potential as a pattern, and I might try that later on in the week. 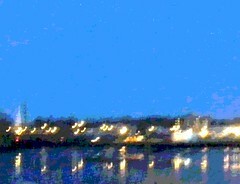 This is the photo I posted yesterday, posterized using Painter IX. Posterizing creates flat areas of color, like a poster. It sometimes works well with low resolution photos, like this one. In this case, I think the effect is to make the colors just a little brighter.